In my chronological reading of C.S. Lewis’ works, I have finally come to the letters where he describes how he thought of The Screwtape Letters. This letter to his brother has caused a lot of confusion over the years, and I thought it would be interesting to post a bit of a paper I am working toward publication. This is the nitty gritty of research, but still a lot of fun. How did C.S. Lewis conceive of Screwtape? Here’s the story. We have some indication of how The Screwtape Letters emerged in Lewis’s imagination, but the timeline for this process is confused. According to a Saturday, July 20, 1940 letter to his brother, Major Warren Lewis (1895-1973), C.S. Lewis had listened to a speech of Hitler’s the previous night. 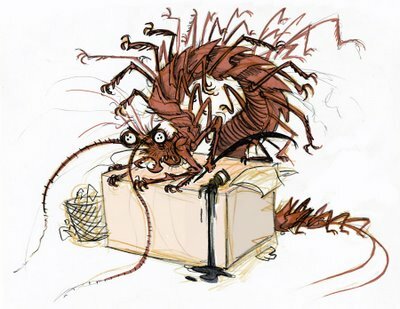 He writes to his brother that he might be weaker than some people, but “while the speech lasts it is impossible not to waver just a little.” A reader familiar with The Screwtape Letters under the threat of Nazi Germany or in the years since can see a Hitlerian haunting in the Screwtapian logic. The upside-down pattern of spiritual direction—the “other point of view”—was born in that moment, and Lewis goes on to give some examples in a voice that would eventually develop Screwtape’s intellectual accent. While both the inspiration of Hitler’s persuasive abilities and the book idea are contained within the same letter, there are some problems of basic chronology. First, George Sayer claims that Lewis attended this inspirational church service on July 15, 1940, which is actually a Monday. While this is probably a simple factual error by an author writing nearly half a century later (1988)—Lewis himself notes that it was a Sunday mass—the dating of the church service in question is variously attributed in the literature. The inaccurate July 15 date is recorded in the 1974 C.S. Lewis: A Biography by Roger Lancelyn Green and Walter Hooper, which also states that inspiration came “following the 8 o’clock Communion,” contradicting both Sayer’s and Lewis’s recollections. The above-quoted letter, which they use as a source, while not immediately clear about which Sunday he had the inspiration, is very specific that it was during an interminable church service, not after. Writing in 2001, Kathryn Ann Lindskoog notes that, “The confusion that began with these inaccuracies persists into the 21st century. Not one biography or study of Lewis includes the correct date; they vary from 14 July (Griffen), and 20 July (Glover) to autumn 1942 (Glaspey). In 2000 dramatist David Payne announced in conjunction with his Screwtape-based play that the idea came to Lewis in 1940 on 30 July.” While trying to offer a critique of a poorly researched timeline, however, Lindskoog further confuses the historical question with this critique. 22 years before Lindskoog wrote Sleuthing C.S. Lewis, the Fount paperback of the Green-Hooper biography corrects the July 15 date to July 14, a Sunday. Lindskoog does not give the “correct date” in Sleuthing C.S. Lewis (as she had in her previous work). We are left wondering, then, why Sunday, July 14 was a problematic date, since the letter is dated Saturday, July 20 and must, reasonably, be written after the inspiring moment. There remain problems with the July 14 date, however, as Lewis notes in his letters of that week that he has been ill around July 14, 1940. A careful reading of the July 20 letter to his brother confirms what Hooper records in his 1996 Companion and Guide: the Sunday in question is most likely July 21, 1940. After Lewis describes his experience listening to Hitler as well as some of his war duties, the letter breaks off with: “Provided always that we don’t meet any Germans I anticipate some considerable enjoyment from this brotherhood in arms. –” The letter begins again with these words, “I resume at coffee-time on Sunday morning. I have been to Church for the first time for many weeks owing to the illness, and considering myself invalid enough to make a mid-day communion.” Walter Hooper’s suggestion of July 21, 1940 comes from a reasonable reading of the letter as written over a two-day period, and actually follows Lindskoog’s suggestion of the same in 1988. Lindskoog is incorrect, then, that “not one biography or study of Lewis includes the correct date,” since Hooper made the correction in 1996. From 1974 to 2001, then, there has been confusion over this simple aspect of the Screwtape timeline, but it appears that Sunday July 21, 1940 is indeed the best choice. Timing issues aside, the way this inspirational moment is used in the telling of Lewis’s story is intriguing. Hooper’s foreword, the Green and Hooper biography, and Sayer’s biography are each missing any connection to the Hitler speech. 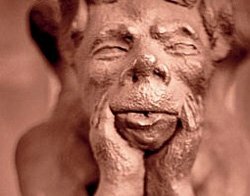 Yet on their online description of the book, Harper Collins suggests that Screwtape is inspired solely by Hitler’s speech, placing the “impossible not to waver just a little” quotation immediately before “struck by an idea for a book.” It seems in the biographies, at least, that the authors will either tell an anecdote of Lewis’s inspiration while his mind wandered during a sermon (or after, as if inspired by the sermon), or point to the influence of Hitler’s speech, but not reference both. While it is easy to understand why Harper Collins publishers would make a link with Hitler on their digital book cover, how consciously the speech formed Lewis’s character of Screwtape is difficult to discern. Lewis himself never makes the link, Lewis’s friends do not recall Hitler as a key influence, and both the administrative context and character of Screwtape are markedly different. 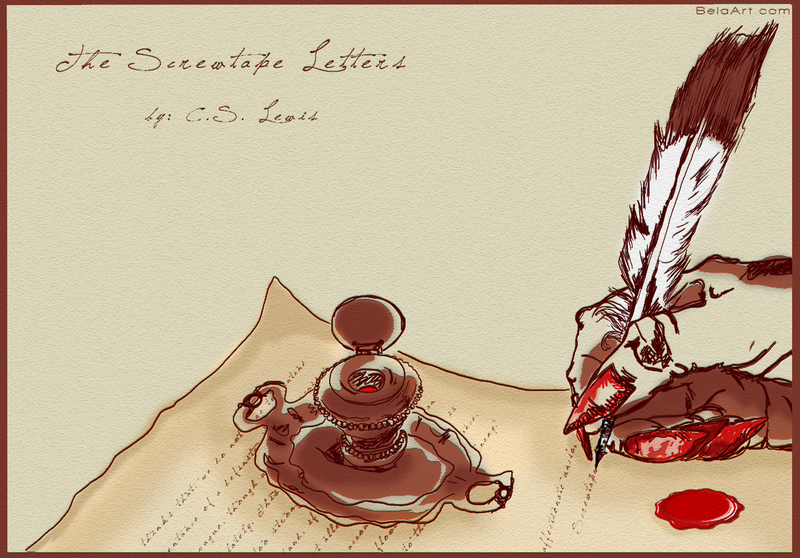 The actual influences on the content of The Screwtape Letters are varied and extensive, drawn in form and content out of the wealth of Lewis’s reading and study. Whether or not Hitler was a conscious inspiration for Screwtape, when it comes to the timeline of the Screwtape manuscript history, it is important simply to note that the idea came to Lewis on the weekend of July 19-21, 1940. Adolf Hitler, “My Last Appeal to Great Britain: A Great Empire Will Be Destroyed: A Speech Made to the Reichstag, July 19, 1940,” Vital Speeches of the Day 6:20 (Aug 1, 1940): 20, 617-625. The speech is archived at ibiblio.org, which misattributes the original publication; last accessed October 25, 2012, http://www.ibiblio.org/pha/policy/1940/1940-07-19b.html. See Hooper, Letters 2, 425. Hooper, Letters 2, 425. Emphasis original. George Sayer, Jack: A Life of C.S. Lewis (Wheaton: Crossway Books, 1988), 272. “e.g. ‘About undermining his faith in prayer, I don’t think you need have any difficulty with his intellect, provided you never say the wrong thing at the wrong moment. After all, the Enemy will either answer his prayers or not. If he does not, then that’s simple-it shows prayers are no good. If He does—I’ve always found that, oddly enough, this can be just as easily utilised. It needs only a word from you to make him believe that the very fact of feeling more patient after he’s prayed for patience will be taken as a proof that prayer is a kind of self hypnosis. Or if it is answered by some external event, then since that event will have causes which you can point to, he can be persuaded that it would have happened anyway. You see the idea? Prayer can always be discredited either because it works or because it doesn’t.’ Or again ‘In attacking faith, I should be chary of argument. Arguments only provoke answers. What you want to work away at is the mere unreasoning feeling that “that sort of thing can’t really be true.”’ Hooper, Letters 2, 427. Kathryn Ann Lindskoog, Sleuthing C.S. Lewis: More Light in the Shadowlands (Macon, GA: Mercer University Press, 2001), 75. Lindskoog here does not giver references for these misattributions. Roger Lancelyn Green and Walter Hooper, C.S. Lewis: A Biography (Glasgow: Fount, 1979), 191. Hooper also asserts the Sunday, July 14, 1940 date in his Foreword to the 1976 Lord and King edition of The Screwtape Letters, see C.S. Lewis, The Screwtape Letters (Chicago: Lord & King Assoc., 1976), 1. In her 1988 work The C.S. Lewis Hoax—a predecessor to Sleuthing C.S. Lewis—Lindskoog apparently recognized the correction and merely footnotes the July 15 date. That recognition, however, disappears in the 2001 book and the previously footnoted error becomes the substance of the accusation; Lindskoog, Sleuthing, 75. The 1994 second edition is identical in this matter to The C.S. Lewis Hoax, Kathryn Ann Lindskoog, Light in the Shadow Lands: Protecting the Real C.S. Lewis (Portland, OR: Multnomah, 1994), 74. For example, his July 12, 1940 letter to his brother and his July 16, 1940 letter to Dom Bede Griffiths. Hooper, Letters 2, 421-422. Hooper, Companion, 267. See also Hooper, Letters 2, 426. Lindskoog, Sleuthing, 75. See also Lindskoog, Light, 74. It is not unusual for Lewis, writing is typically lengthy letters to his brother at war in France, to write the letters throughout the week or throughout the day on Sunday. His May 18th, 1940 letter, for example, he wrote on that Saturday, breaking off with greetings from friends. He resumes: (Continuing on Sunday after church). He then notes at the end of the letter, “After beginning this letter to you I took the learned Poggio for a walk.” The illustrious Poggio is the dog, and the walk was in the evening, so the letter may have been finished the following day. See Hooper, Letters 2, 414-418. Writing two decades later, Hooper includes both the Hitler reference and the pew daydreaming, Companion, 267-268. Lindskoog also leaves out the Hitler references as they are not pertinent to her study. Anonymous, “The Screwtape Letters: A Reading Guide,” last accessed October 25, 2012, http://www.harpercollins.com/author/authorExtra.aspx?isbn13=9780060652937&displayType=readingGuide. See David Hein, “A Note on C. S. Lewis’s The Screwtape Letters,” who argues that the imagery in Screwtape is influenced by his war and invasion context. 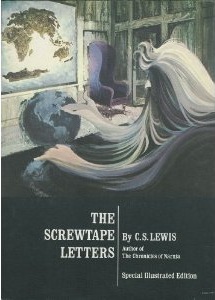 Alan Jacobs notes the war context of The Screwtape Letters and quotes Lewis’s wavering comment from his letter, but does not make the link of Screwtape inspiration to Hitler explicit, The Narnian: The Life and Imagination of C.S. Lewis (New York: HarperOne, 2008), 104; 220-222. It is intriguing to note that recent biographer, Alister E. McGrath, avoids the issue by writing that the idea came to Lewis “in July 1940.” See C.S. Lewis: A Life: Eccentric Genius, Reluctant Prophet (Carol Stream, IL: Tyndale, 2013), 215. This entry was posted in Fictional Worlds, Lewis Biography, Original Research and tagged Alister McGrath, books, C.S. Lewis, fantasy, Hitler, Kathryn Lindskoog, literature, Screwtape, the devil, The Guardian, The Screwtape Letters, Walter Hooper, writing, WWII. Bookmark the permalink. My blushes! I have no idea exactly how that worked: did the BBC on this occasion (and others?) broadcast someone reading an integral translation of Hitler’s speech? If so,who read/voice-acted it out? My instant response (before following your link) was that Lewis somehow heard it in German, which stirred up a question I have been worriting around a bit – how much so we know about how good Lewis’s German was? I have just been wondering (without doing any homework on it, yet) about any possible imaginative lines from the Infernal bureaucracy of Screwtape to the imagined immediate post-war Britain of That Hideous Strength with the NICE (and also the satire of college politics) to the world of competing totalitarian regimes of Orwell’s 1984 (which book I suspect has more than one debt to THS – I think I remember someone writing interestingly about Lewis and Orwell in Mythlore years ago, but don’t have a reference). David, I’m glad you asked this. I don’t know the answer. The books say, “Lewis heard a translation of the speech on BBC.” I presume they are right, but I don’t know the protocol for that. Did the BBC really translate on the fly? Pretty risky. Or did they read a provided German translation? I doubt it. Did they just play the really long speech in German? I also doubt that. The most likely is that it was translated simultaneously, or with a delay, and Hitler’s voice was in the background. I just don’t know more. I don’t know anyone who has formalized the relationship between THS and 1984, but it’s pretty obvious that they are (at least) drawing from the same cultural moment. Part of what my work does is place Screwtape into the Space Trilogy and reread the Ransom books together. I’m eager to learn more about that, when you’re ready to impart it, in whatever forms! I’m eager to learn too! I’ve heard that there is a show about Hitler wandering around modern Germany–a comedy, I presume.